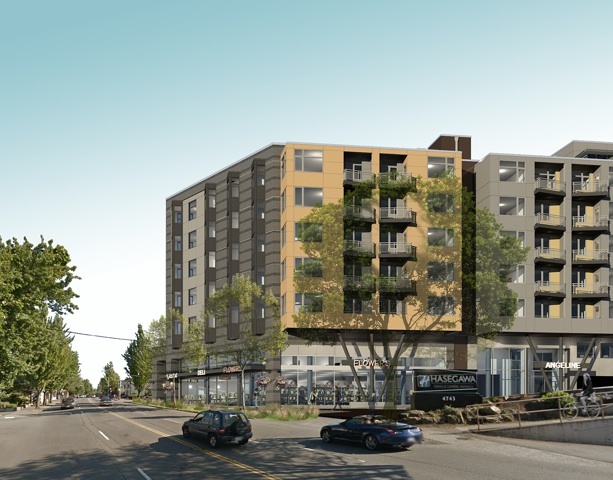 Besides the giant 6-story crane looming above Columbia City, there hasn’t been too much talk lately about The Angeline, PCC’s new home with 193 residential units above. As the details of the project began to reveal themselves about a year ago, a lot was reported about the design and the major decisions regarding initial sketches and plans. Since then, though, details (or at least the reporting on them) have stalled out a bit. I did stumble across this flyer regarding the details of the additional (non-PCC) retail space that is also available as part of the project. There’s some pretty interesting info not only about the space itself, but also how Columbia City is being marketed to potential businesses and the proposed demographics of the neighborhood over the next few years.